As a blogger I shouldn’t be anti-electronic communication, but I have a real soft spot for good old-fashioned pen and paper. For me, handwriting has always been very cathartic in so many ways. I’ve always loved to write notes and letters to my friends and many times I would write to myself just to clear my head or organize my thoughts. There’s often an organic connection there that I just don’t get out of typing on a computer. Right now I have two pen pals (Hi Joana and Olivia!) who I write to regularly, though admittedly not as often as I should. 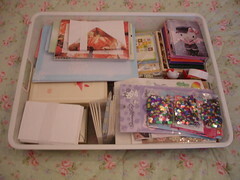 I tend to write many letters and notes in my everyday life to friends and family though. It’s a quickly fading art that I wish more people would take up and cherish as I do. Starting to write letters certainly doesn’t mean you have to go out and get a pen pal; there are many ways to get started small! First off, stop buying over-priced greeting cards. Especially if you’re sending the card through the mail anyway, send a letter instead. I feel that rhyming insincere cards are never as cherished as a short note handwritten with care. A simple message in legible handwriting (no typing!) on plain printer paper will do fine and remember that no one expects grand poetry. Happy Birthday! I’m so sorry I couldn’t be with you this year, but I will visit as soon as I’m able. I hope you enjoy the gift I’ve enclosed and I will be sure to call you on your special day. Once you get in the hang of writing letters it comes very easily as you’ll want to find more reasons to write letters and notes. click to see the larger size!